Spray 12x10-inch sheet of foil with nonstick cooking spray. In medium bowl, combine pasta sauce and zucchini; mix well. In another medium bowl, combine cottage cheese, spinach, Parmesan cheese and oregano; mix well. Spread 1/4 cup sauce mixture in ungreased 8-inch square (2-quart) glass baking dish. Top with 2 lasagna noodles. Spread about 1/2 cup sauce mixture over noodles. Drop 1/2 cup of spinach mixture by small spoonfuls over sauce mixture; spread carefully. Sprinkle with 1/4 of mushrooms and 1/2 cup of the mozzarella cheese. Repeat layers 3 more times, beginning with noodles. Cover with foil, sprayed side down; refrigerate at least 8 hours or overnight. Heat oven to 400°F. Bake covered for 45 minutes. Uncover baking dish; bake an additional 10 minutes or until lasagna is bubbly around edges. Let stand 10 minutes before serving. Look for precooked oven-ready lasagna noodles near the dry pasta in the grocery store or in the frozen pasta section. Trim the precooked lasagna noodles to fit, if necessary. This recipe may be baked immediately after assembly. Cover the dish with foil and bake at 400°F for 30 minutes. Uncover the dish and continue baking for about 10 minutes, or until it is bubbly around the edges. Betty loves adding a modern twist to classic comfort food dishes. 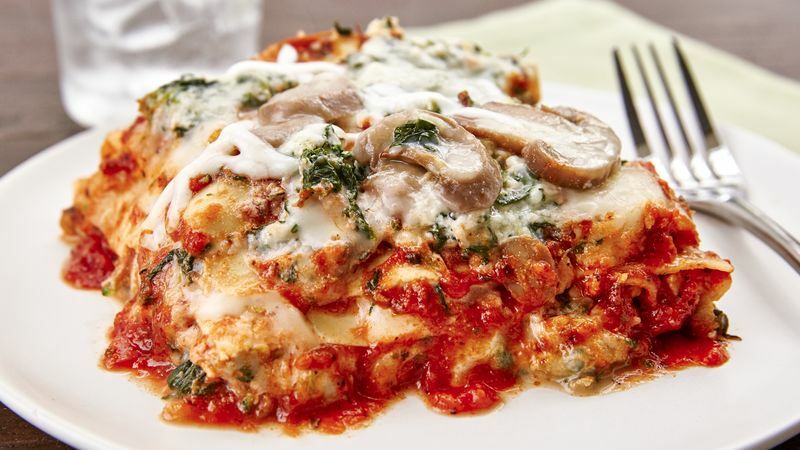 This time, she turned everyone’s favorite Italian dish into a delicious vegetarian lasagna featuring zucchini, spinach, mushrooms and lots and lots of cheese. But no matter how many new lasagna recipes you try, there are always a few consistencies passed down from Italian tradition: flat lasagna noodles, lots of flavorful sauce and layers of ricotta, Parmesan and mozzarella. There are also many ways to perfect your lasagna (vegetarian or otherwise), whether it’s layering your noodles just right or getting the right proportions of cheese. Make sure to explore Betty’s tips for making the perfect lasagna, so yours turns out cheesy and delicious every time.